This sophisticated former model home in heritage crossings, yorba linda, leaves a first impression that will last. Colorful landscaping & shade tress grace a gated front entrance that provides the ideal introduction to this comfortable craftsman-style residence, complete w/ stone-accented features & covered entry. Only lived in for 2 years, the timeless architecture continues throughout the 3 story design, which features 3 bedrooms & 3 baths in over 1,600 sq. Ft. Of living space. 1 guest suite & full bath is located on the second level w/ custom lighting, draperies & beautiful white brick wall, while the third level is home to the master suite w/ custom lighting, draperies, headboard, paint moldings & gorgeous view of the mountains, walk-in closet, quartz dual vanities, marble flooring & marble walk in shower along w/ 1 additional ensuite bedroom w/ custom lighting, draperies, walk in closet w/ mirrored door & separate bath w/ tile back splash. Genuinely special, the extensively upgraded multi-level condo is generously proportioned w/ an abundance of natural light, open main living concept w/ a spacious living room/dining room area w/ viewing balcony & custom window treatments. There's a mix of hardwood, carpet & tile flooring. 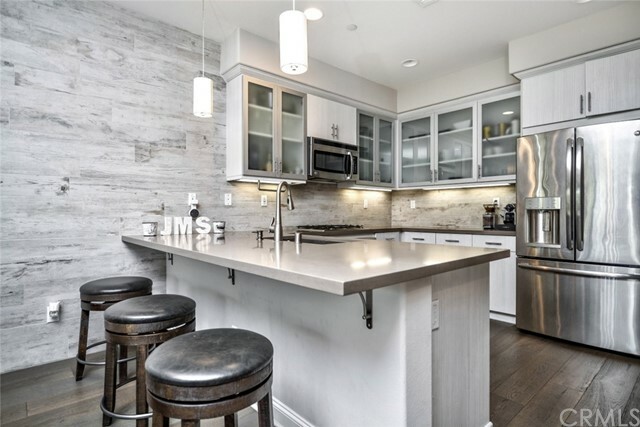 The kitchen offers upgraded cabinetry w/glass panels, stainless steel appliances & quarts counter tops. The laundry is located on the 2nd floor & a spacious tandem 2 car garage is attached. Park like frontage w/ easy access to outdoor cooking. For more information or make an appointment to see property ID PW19069097.